18 years ago, after 20,000 Leagues Under the Sea Submarine Voyage docked in its Vulcania port for the last time in the Magic Kingdom, Imagineers took some of the water from that attraction and stored it away. They were saving the waters, as it were, for a rainy day. We often think of the current batch of Imagineers in terms of the wonderful ways the pay respect to all that has come before, but the saving of the water shows that there was an eye towards the future. The future of 20,000 Leagues. The future of this corner of Fantasyland. The future of the Magic Kingdom. Now, do I suspect that they knew that one day an attraction would be returning to that same spot in Fantasyland? Returning with a watery theme that could tie the past and future together? No, but they kept that water from 1994 just the same and hoped to be able to utilize it once more somewhere within Walt Disney World. As fate would have it, a long-shelved idea for a dark ride based upon The Little Mermaid would be resurrected and come to occupy the very area that 20,000 Leagues Under the Sea Submarine Voyage once had. 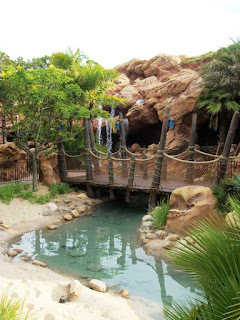 Earlier this week, Imagineering led a group in returning the lagoon waters to what is now Ariel’s Grotto. This symbolic gesture shows, once again, that the elements that made Walt Disney World great in its early years have not been forgotten, and that tribute can be paid in incredible ways. However, the waters from 20,000 Leagues Under the Sea Submarine Voyage aren’t the only tributes to the attraction at Under the Sea – Journey of The Little Mermaid. The queue features the perennial 20,000 Leagues sea shanty, Whale of a Tale, as well as rock work designed to look like a Nautilus. I don’t want to give too much away, but let’s just say that I even feel there is a 20,000 Leagues inspired descent within the attraction. Then again, I could be seeing giant squid where there are only seagulls. The point is, Walt Disney World and Imagineering didn’t have to save those waters, and they didn’t have to use writers, bloggers, and podcasters to return them to the 20,000 Leagues Under the Sea corner of Fantasyland, but they did anyway. The recognition of the Magic Kingdom’s history, whether in the return of the Little Orange Bird and Citrus Swirl, the nods to Mr. Toad in The Many Adventures of Winnie the Pooh, or the care taken in the Haunted Mansion’s graveyard revamp, there is something to be said about remembering where you come from, and looking to where you might be headed. Adding a bit of 20,000 leagues water to the Mermaid area is a nice touch. It's a good reminder that there are people at Disney who care about the park's history as part of the Big Picture.